We’d love your help. Let us know what’s wrong with this preview of Frankie Stein by Lola M. Schaefer. Frankie Stein comes into the world on a bright, sunny day. He’s not at all like his parents, Mr. and Mrs. Frank N. Stein. They’re scary looking. He’s cute. They try to make him look like them. They can’t. But he does end up being scary—just in his own way! Kevan Atteberry’s digital illustrations lend a hand to this family-friendly story perfect for a Halloween read aloud. To ask other readers questions about Frankie Stein, please sign up. Something is wrong with the Stein's baby! It's . . . cute!?! With his peachy-pink skin, and golden hair . . . oh, how will they ever make him look scary? I wasn't wild about the illustrations, but the story, and the message about being yourself, more than made up for that. Frankie is born to the Frankensteins, and to their horror, he appears humanly conventional, not scary. But Frankie h Thanks to Melki for her review that led me to read this book, which reminded me of Katherine Dunn's Geek Love. Geek Love is a about a couple of freaks in a freak show who value differences from the "norm," since the more grotesque their children are, the more successful they are in the freak show. It's a crazy allegory about difference and the contextual nature of value and beauty. Cute Halloween story. The Frankie Stein's did not enjoy that their first born son did not look like them so they tried everything to make him look like them until one day when Frankie wanted to be scary himself. He scared his parents so he could be the person he wanted to be and not what they tried to make him be! Cute story! 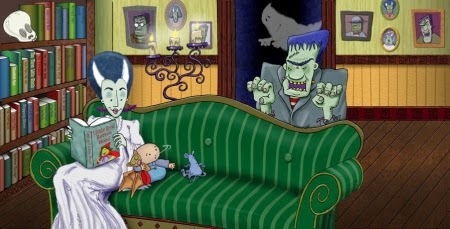 Frankenstein and his bride have a baby who is cute rather than monstrous. At first they attempt to alter this appearances, so that he resembles them, but in the end they accept Frankie as a different kind of scary. This is a movie monster twist the classic tale of parents whose child is different from the other members of their family. Their first impulse is to try to make the child fit in with the rest of the family. But after this fails, they usually come to terms with the child's differences a Frankenstein and his bride have a baby who is cute rather than monstrous. At first they attempt to alter this appearances, so that he resembles them, but in the end they accept Frankie as a different kind of scary. This is a movie monster twist the classic tale of parents whose child is different from the other members of their family. Their first impulse is to try to make the child fit in with the rest of the family. But after this fails, they usually come to terms with the child's differences and accept the child as s/he is. This, of course, differs from reality where the person who is an outsider within his/her own family often suffers constant lifelong conflict. I like that Frankenstein is in it. 3.5 stars. It runs a little too wordy for preschool storytime but the theme of acceptance and being true to yourself would be a nice one. Likely a fun Halloween read. The illustrations in Frankie Stein were a Frankie Stein was my son's library pick this past week. It turned out to be a really cute Halloween read. This was a Halloween inspired story about a child who was not exactly fitting into the mold that his parents wanted him to. The story is engaging for children and can be used as a good real aloud for entertainment. The message behind the story is that people can be unique and do not have to act just like someone wants them to. This story is about accepting others as being different and still caring about them. Frankie Stein tells the story of Mr and Mrs. Frank N. Stein's first born child. The problem? He has beautiful white teeth, beautiful white skin, and golden hair. Mr. and Mrs. Frank N. Stein do all they can to make him look and act like a Stein. It isn't until Frankie decides to be himself that he really fits into the family. This is a very cute book and a great addition to Halloween collections. I did not enjoy this book. Mr. and Mrs. Frank N. Stein have a child who looks nothing like them. They try to change the child, Frankie, to look and act like them. As much as Frankie tried, that was not who he was, though. The one aspect of this book that I liked was the theme of originality. Frankie wanted to be himself and not what anyone else wanted him to be. Frankie Stein is not like his parents. They are scary looking and he is cute. They try to make his scary but they just can't. In the end, he finds his own way to be scary. Cute Halloween story that will make kids laugh. A humorous story about Mr. & Mrs. Frank N Stein whose son does not look scary like them. I chuckled throughout and young children will get a kick out of the way the parents try to get their son to be scary like them. If you are looking for that perfect kid-friendly Halloween read aloud book, look no further! Frankie Stein is an unforgettable humorous tale of individuality and acceptance of oneself and also of others. Visit Reading Jungle for the entire review! Thus book is a delight! Not only is it well written but the illustrations are too cute, but it's more than that. It's the message that each of us is born just the way we are supposed to be. So be yourself it's what you're best at! Mr. & Mrs. Stein are shocked when their child is born looking cute instead of frightening. They try to make him scarier, until he figures out a way to really scare his parents... A cute story about finding your place in a family. This is a fun book about how a character can be different and embrace their uniqueness. 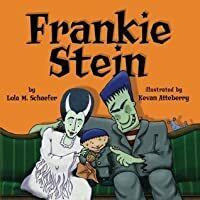 There is a twist from the usual or traditional Franken Stein story because the parents are monsters and the little boy is a typical human. This was an interesting book for me to read, because it was all about parents that did not accept their child. I feel like even though this was meant to be more along the lines of humor, but for a child who isn't accepted by their parents or caregivers might take this book seriously and be hurt. This was a cute book to illustrate the idea that everybody is different and unique in their own way. This book would be good to use for younger grades and maybe even for students who had been adopted and don't look like their parents. Very cute book about the son of Frank N. Stein and his wife who just isn't like his parents. They try all they can to make him like them, but he surprises them in the end by wanting to just be himself. The illustrations are great and my classes loved hearing this story. Frank really liked this book, possibly just because his name is Frank. Crappy computer art but I enjoyed that being "normal" meant being the most frightening of all. Subversive, much? Cute and change of ending than expected. The third graders I read it to loved it and the way it ended. I enjoyed this book. Fun for Halloween. Frankie doesn't quite fit into his family until he finds his own way to be scary. A good book about being different in a family, kind of silly, but fun. Such a cute Halloween book--a holiday favorite in our home! My six year old thought this was a funny book. He didn't believe the boy was their son. He also liked the illustrations. Great fun! Monsters have a "normal" son and try without luck to monsterize him. Would be good for monster storytime or one scheduled in October, although dare us not say Halloween!